Farsaraei*, S., Moghaddam, M., Mehdizadeh, L. (2017). Chemical composition and antifungal activity of thyme (Thymus vulgaris) essential oil. 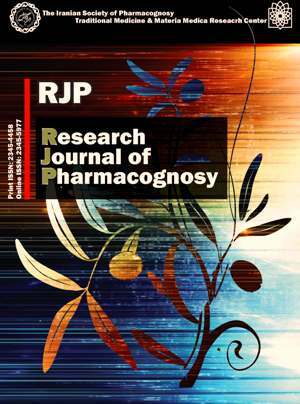 Research Journal of Pharmacognosy, 4(Supplement), 43-43. S. Farsaraei*; M. Moghaddam; L. Mehdizadeh. "Chemical composition and antifungal activity of thyme (Thymus vulgaris) essential oil". Research Journal of Pharmacognosy, 4, Supplement, 2017, 43-43. Farsaraei*, S., Moghaddam, M., Mehdizadeh, L. (2017). 'Chemical composition and antifungal activity of thyme (Thymus vulgaris) essential oil', Research Journal of Pharmacognosy, 4(Supplement), pp. 43-43. Farsaraei*, S., Moghaddam, M., Mehdizadeh, L. Chemical composition and antifungal activity of thyme (Thymus vulgaris) essential oil. Research Journal of Pharmacognosy, 2017; 4(Supplement): 43-43. Department of Horticulture, Faculty of Agriculture, Ferdowsi University of Mashhad, Mashhad, Iran. Background and objectives: The antifungal activity of the essential oils and their constituents against some phytopathogenic fungi has been reported. Thymus vulgaris (Lamiaceae) is one of the Thymus species. A large number of studies have concerned the chemical compositions and antifungal activity of thyme’s oil. In order to reduce the use of synthetic fungicides, recently considerable attention has been given to search for naturally occurring compounds. The aim of the present work was to determine the chemical composition and antifungal activity of T. vulgaris oil cultivated in Iran. Methods: The essential oil from aerial parts of the plant at full flowering stage was subjected to hydrodistillation and chemical compounds were analyzed by GC/GC-MS. The in vitro antifungal activity against three phytopathogenic fungi (Drechslera spicifera, Fusarium oxysporum f.sp. ciceris and Macrophomina phaseolina)by of the oil was evaluated by agar dilution method. The data were subjected to ANOVA according to the SPSS 21 software. Results: Totally 45 compounds representing 96.75% of the oil were found. Thymol (36.81%) and ρ-cymene (30.90%) were the main components of thyme oil. According to the results, the antifungal activity of the oil increased with a rising in concentration. All of the tested fungi growth was completely inhibited on 1600 µL/L. In this study fungicidal activity was only observed on F. oxysporum and D. spicifera at concentrations higher than 800 µL/L. Conclusion: The antifungal activity of T. vulgaris essential oil could be probably due to the high concentration of oxygenated monoterpenes (thymol) and monoterpene hydrocarbons (ρ-cymene).